TIM CUP - IMPRESA ATALANTA: JUVE BATTUTA 3 A 0! TIM CUP LA FIORENTINA UMILIA LA ROMA: FINISCE 7-1! MILAN, GATTUSO: "COL NAPOLI VOGLIO PERSONALITÀ"
NAPOLI-SASSUOLO, LA SOCIETÀ: "SI APRE L'ANNO NUOVO CON UNA VITTORIA. GOL DI 'RAPINA' DI MILIK E LA CHIUDE FABIAN"
SASSUOLO, LOCATELLI: "COPPA ITALIA, COMPETIZIONE IMPORTANTE. 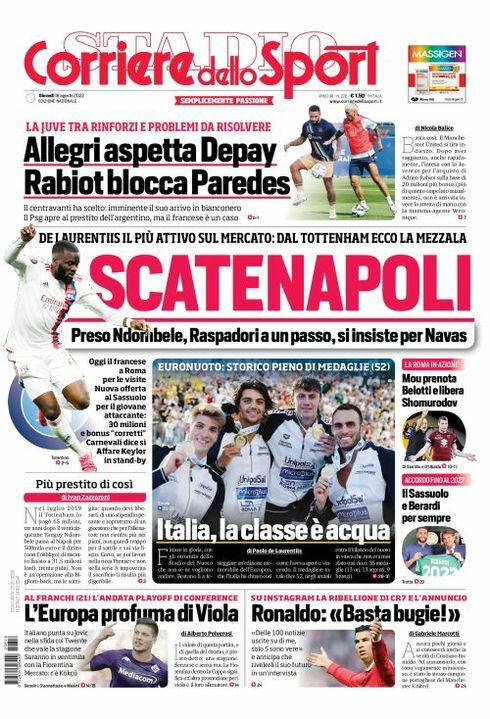 NAPOLI? CERCHEREMO DI AFFRONTARLI AL MEGLIO"
COPPA ITALIA - LA SSC NAPOLI: "GARA CON IL SASSUOLO, CAMPO DA DEFINIRE"
UFFICIALE – COPPA ITALIA, CAMBIA IL REGOLAMENTO PER IL TRIENNIO 2018/2021: CI SARÀ IL SORTEGGIO DEL CAMPO DI GARA!